True to his word, Bruce Ross delivered a Zaius custom figure yesterday. 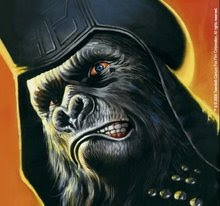 I think this one captures the attitude of Zaius better than the previous one did of Ursus. Click on the picture to go to the site for more shots, including the two together.